The blogging machine is chugging right along! On August 17 my friend Amy (not to be confused with my other friend Amy) and I took a day trip to Columbus, Ohio. We swung by Franklin Park Conservatory (which I'll cover in the next post), plus the Columbus Topiary Park, the grounds at Ohio State University (OSU), an unexpected garden in Schiller Park, and the Whetstone Rose Garden. 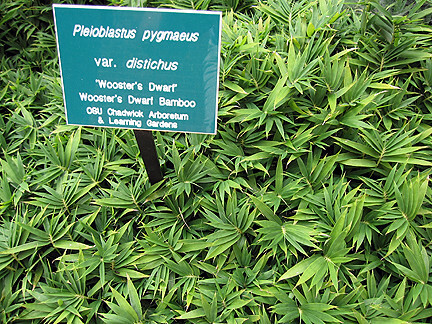 I'll admit I'm not big into topiary for the same reason I'm not big into bonsai — I prefer plants in their natural form. 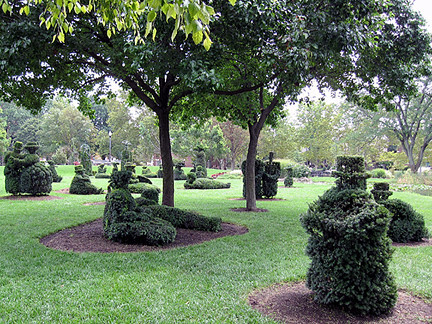 However, the Columbus Topiary Park changed my mind! On the grounds of the old School for the Deaf, this public park covers seven acres near downtown. 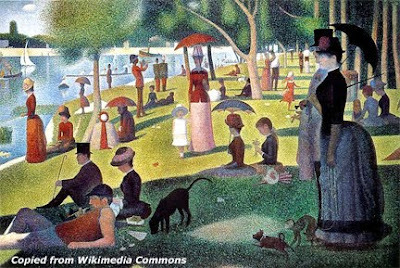 The garden recreates Georges Seurat's painting, A Sunday Afternoon on the Isle of La Grand Jatte. I've seen the painting a few times at the Art Institute of Chicago (waves to Chicago-area blogging friends! ), and it's impressive! The colors are very vibrant and it's huge, about 7 by 10 feet (and took him two years to complete)! Mason constructed the bronze frames and planted the shrubs, and his then-wife Elaine was the first topiarist. 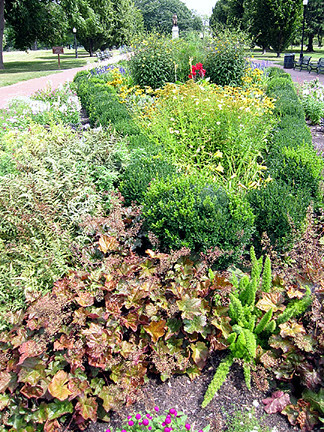 Today the park is maintained by Columbus Recreation and Parks and by the Friends of the Topiary Park. 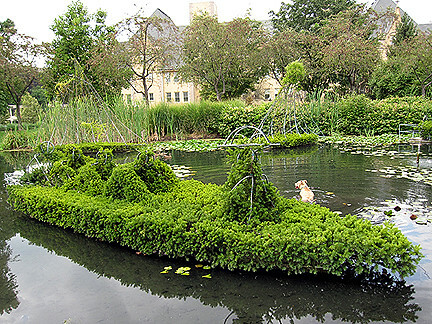 There are topiary figures of 54 people, eight boats, three dogs, a monkey, and a cat. They are made of yew (some still has to fill in, as you can see). The pond (which represents the river Seine) is very cool, figuratively and literally as this doggie demonstrates on the sweltering day we visited. The sails of the boats will fill in with clematis. Next we swung downtown to see the capitol building (which oddly has no dome; if I were a normal Ann Arborite, I'd now be making disparaging jokes about the intelligence of our southern neighbors, but I think it's fair to say I'm not normal!) and made a quick trip through German Village, which has very nice brick buildings and an overall quaint feel. I'd been there a few years ago on a home and garden tour. Even though it was very, very hot that day, lots of people were walking through this public park, and why not? it's truly a treasure for the city. 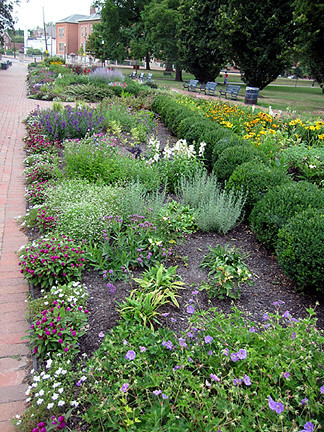 It's maintained by the German Village Society. 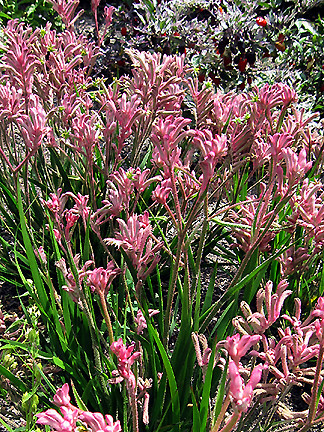 I love the pink flowers of kangaroo paw (Anigozanthos gabrielae). 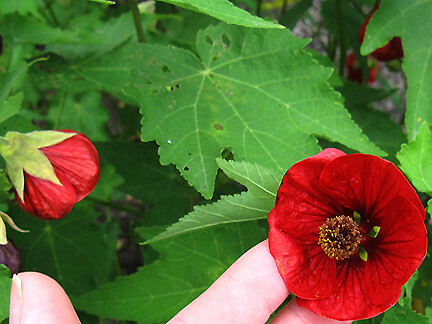 They had a lovely color of flowering maple, which I first learned about this spring over at Dirt Therapy. 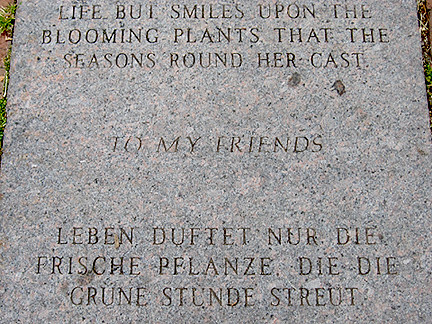 In addition to the long flower bed and statue, Schiller Park also had really cool sayings engraved in stones on the walkway, in German and English. And of course it had plenty of benches! 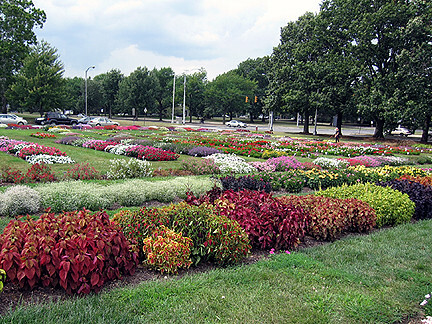 Next we headed to see the official gardens at Ohio State University. 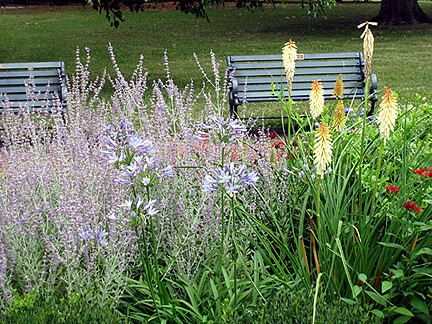 The Learning Gardens contained these amazing trial gardens, which were quite colorful and inviting. I thought they looked like a wonderful quilt laid out in front of the buildings. There was also a small bamboo garden, tucked into a concrete corner that I would have missed altogether if it weren't for Amy's eagle eyes. I was amazed at this tiny bamboo, only a few inches tall. Normally they get well over 10 feet! 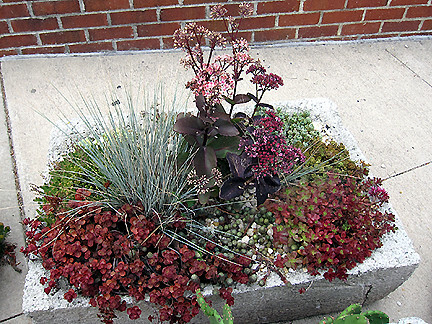 I really liked this planter; the colors matched the surroundings perfectly. 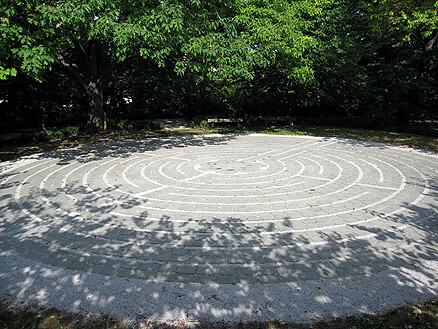 At Lane Avenue Gardens, there was a cool labyrinth, which doesn't look like much at first glance, but it takes quite a bit of time to walk from start to finish and I think it would be quite relaxing for stressed out students. I admit I was a little disappointed with the Chadwick Arboretum, however, which I don't feel reflects the fact that OSU has a world-class horticulture program and it's the state's land grant college. The trees were not labeled, there was no clear path through the trees, and the turf was long. Its "prairie" was anything but. At first I thought I was trespassing on research grounds (the first time I was at the arb a few years back, I didn't think I was even in the right place), but it was indeed the public arboretum. 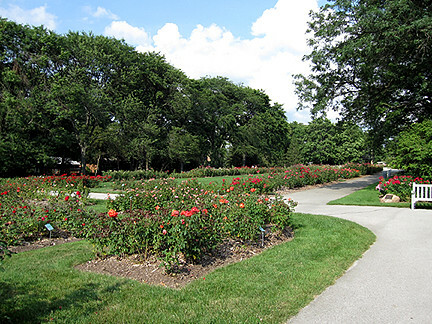 Heading north on High Street, we visited the Park of Roses in Whetstone Park. 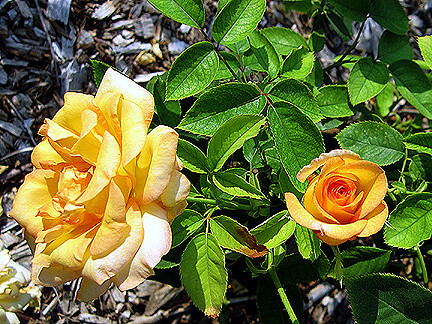 It's no secret I'm far from being a rose aficionado, but this garden impressed even me. There was even a separate garden of "earth-friendly" (low-maintenance, low-chemical care) roses, interspersed with interesting evergreens, which was a really cool planting style. 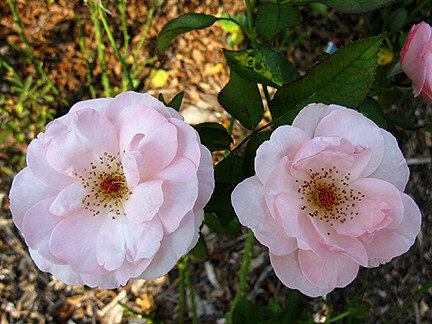 I loved this delicate pink hybrid tea rose, 'Audrey Hepburn' (even though Kate is still my favorite Hepburn!). Check back Monday for more. Chihuly fans won't be disappointed! What a wonderful tour. I almost felt like I was back in Germany! Wunderbar! Such a shame on the arboretum. I mean if you don't have the tags what is the point? Must be a funding issue. Everyone is strapped lately. Mom is so silly: She listened to the Beethoven piece on youtube and got tears in her eyes. The places you visited look very inspiring! Ok, I think that topiary garden deserved a post all by itself! That was so awesome! That succulent planter is very nice too. Love those dark sedums. Thanks for the lowdown on your visit Monica. I liked the topiary in this garden as it made me smile. Ask me yesterday if I like topiary - and I would have said 'no'. Now I want a topiary park near me. 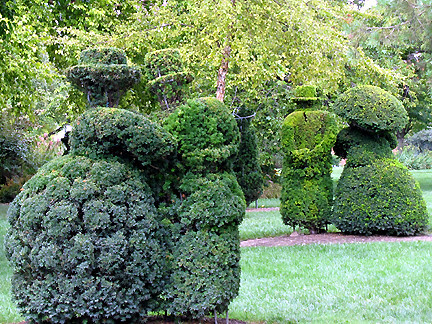 Did you read the post about Pearl Fryar's garden of topiary on the Manic Gardener's Blog, a while back? I found that inspiring too. I can say I am totally enamored of the topiary garden. I would love to see it in person. The topiaries are so big! The water garden is a jewel too. Thanks for the garden tour. Your pictures are great. 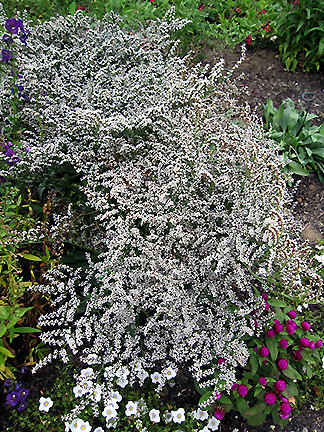 I believe the bush of white flowers is a spiera, but not sure. Thank you for the tour Monica! 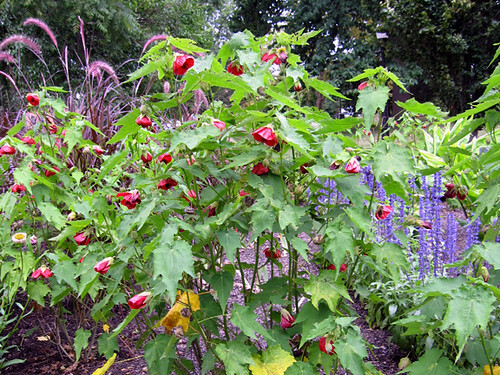 The topiary and the Flowering Maple are outstanding. The topiary garden is fantastic! 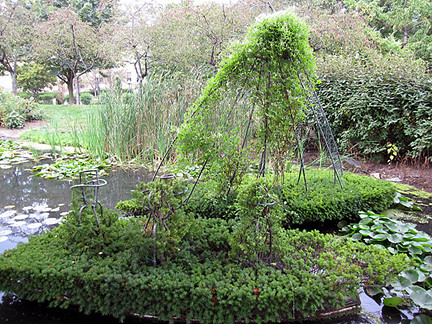 I've always loved topiary - some is humorous, some awe-inspiring and some just aesthetically beautiful. I wish I could visit this garden. Monica, you certainly do get around:) Wait a minute, I do mean that in a nice--and envious--way; I mean, that I applaud you for making use of your free time to visit so many places! 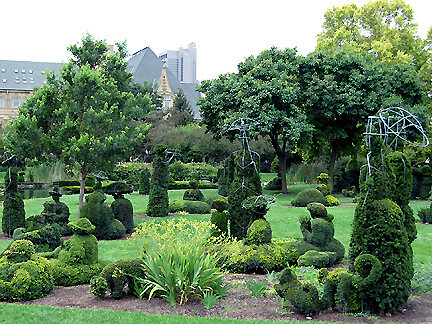 I love the Topiary Garden imitating Seurat's painting--what fun! I've never seen anything like this on such a scale before. Schiller Park is beautiful, too. Having once been an organist, I used to play "Ode to Joy" often. Is there a special connection between Columbus and Schiller? I'm just wondering why they chose him of all the German poets to honor. Chihuly will be in Nashville in 2010, so the MOBOT exhibit will be a good prelude! I so wanted to be able to meet you there and introduce you to Ted Drew's Frozen Custard! Yummy!
. . . waves back!. . . I shared similar feelings about bonsai and topiary until recently Monica. Sometime this spring I watched an HGTV special (go figure - an HGTV program that was actually about gardening,) called "A Man Named Pearl," about Pearl Fryar's amazing South Carolina topiary garden, created from free, cast-off plants from a local nursery. That place changed my mind completely. If I ever make it to SC, that's a place I will have to see in person. I'm off to check out Manic Gardener's post. That HGTV program was one of the most memorable TV garden programs I've seen.